Greet and serve refreshments to volunteer blood donors after the donation process. Friendly, courteous, dependable volunteers with great customer service skills are needed to monitor the donor refreshment lounge. Friendly interactions with blood donors and staff. Some standing and mobility required. Help to make the volunteer blood donors feel appreciated. Visit with donors and help keep the refreshment lounge organized, stocked and neat and clean. Make an impact on the community by helping us save lives. It would be great to have your help on one shift per week. To join the Vitalant Volunteer team please log on to our website: www.bloodsource.org/volunteer to complete the volunteer application and to set up your Volunteer Resources account, which is where you will be able to view and sign up for the many volunteer opportunities. Keep in mind that volunteering in no way gives an edge for Vitalant employment and volunteers are not allowed to perform regulated tasks or receive hands-on donor clinical experience. We are not able to offer internships, mentoring or job shadowing. Vitalant does not accept volunteers for court ordered community service hours. 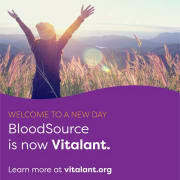 Thank you so much for your interest in volunteering at Vitalant (Formerly BloodSource)!